As we can see power shifting from West to East on a daily basis at the current time of writing, in the fourth quarter of this year the Shanghai Gold Exchange (SGE) will launch an international board in the Shanghai Free Trade Zone (FTZ) for investors worldwide to trade gold spot contracts denominated in renminbi. The purpose being is becoming not only the world’s primary physical gold market but also increase pricing power and internationalize the renminbi. The SGE international board will be another blow to the US dollar hegemony, as more people around the world will hold renminbi, use the renminbi for trading gold and China wil have more power in pricing gold, though the international board’s pricing power can only be wholly exploited when the renminbi is fully convertible. Currently I don’t have any official documentation on the launch of the SGE international board, but by reading media (one, two, three, four) and from a source in the mainland, this is what I understand of it at this point: China’s central bank, the Peoples Bank Of China, has given approval to the SGE to set up a subsidiary company called the Shanghai International Gold Trading Center to operate the international board. The SGE is currently working on member recruiting, including commercial banks, gold producing companies and investment funds. Allegedly HSBC, ANZ, Standard Bank, Standard Chartered and Bank of Nova Scotia are to take part in the global trading platform. A free trade zone (FTZ), also called foreign-trade zone, formerly free port is an area within which goods may be landed, handled, manufactured or reconfigured, and re-exported without the intervention of the customs authorities. Only when the goods are moved to consumers within the country in which the zone is located do they become subject to the prevailing customs duties. 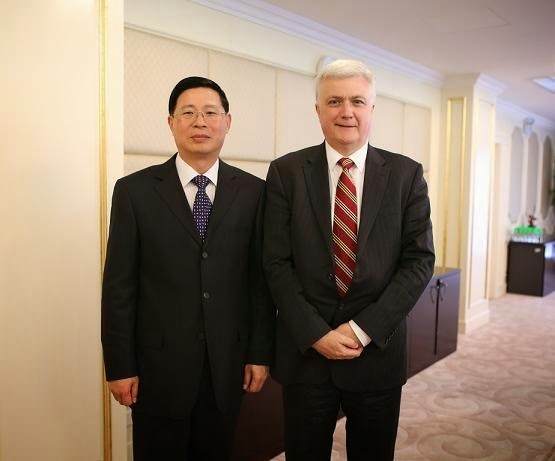 On June 26, Xu Luode, President of China Unionpay, was invited to attend the “Lujiazui Forum 2010,” …President Xu Luode delivered a speech on How Chinese Financial Institutions Can Go Global during the Post-crisis Era. New changes in the international economic pattern, especially the financial pattern, provided significant opportunities for Chinese financial institutions to go global, while the challenges were also formidable. Chinese institutions need strategy and holistic knowledge to promote globalization strategy prudently and steadily and successfully grow to be international corporations, expressed President Xu Luode in his speech. President Xu Luode emphasized in his speech that the internationalization of an enterprise was not only the business behaviour of the enterprise itself, but should be also closely linked with national strategy and strategies of relevant enterprises. Since 2004, CUP’s internationalization has closely coordinated with the “reaching out” strategy of the country, and at the same time cooperates and interacts with the expanding of Chinese financial institutions and the internationalization of the Chinese Renminbi, thus achieving relatively rapid development. The Chinese gold market is an important force, a positive energy in the international gold market but its influence does not correspond to its mass and scale. Last year China’s domestic gold mines produced 428 tonnes; at the same time China imported 1540 tonnes of gold, adding up to nearly 2000 tonnes. China’s import volume is significant but China’s influence on the price of gold is very small. Real influence still lies in the West. Data such as Non-farm payroll, or even a speech could impact the gold market in a big way. In this sense, the mass and scale of China’s gold market and its influence in the international gold market does not match. Through the SGE international board Chinese pricing power will increase. Foreign investors can directly use offshore yuan to trade gold on the SGE international board, which is promoting the internationalization of the renminbi. The international board will form a yuan-denominated gold price index system named “Shanghai Gold”. Shanghai Gold will change the current gold market “consumption in the East priced in the West” situation. When China will have a right to speak in the international gold market, pricing will get revealed. New York prices gold through bidding whereas the gold price is fixed by five banks in London. However the London gold fixing price is now being questioned since these five banks are price-fixers while at the same time they are also the market’s most important participants. The development of China’s gold market is not limited to an increase in scale but a series of moves including market development, product improvement, system development and risk prevention. Marketing, pricing mechanisms and international standards are all very important building blocks so every aspect of China’s gold market should join forces to speed up development. The Shanghai Gold Exchange has nearly 8,000 institutional investors and nearly 5 million individual investors. The International board will be a platform with global investors. This will raise the standard of product assortment, ability to prevent risk, information technology and support, market promotion and regulation. China is fully qualified and may become the world gold market’s very important first class player. Regional commercial banks should seize the trends and opportunities in the development of China’s gold market, and become actively involved in the market. Though we’ll have to wait for the details on how the SGE international board will exactly operate in a few months, it’s influence on the global gold market will be significant and this will further deteriorate the status of the US dollar hegemony.